Photo by Angela Denning-Barnes, KYUK – Bethel. Heading west from Bethel towards the Bering Sea the lakes get bigger and there are more of them. 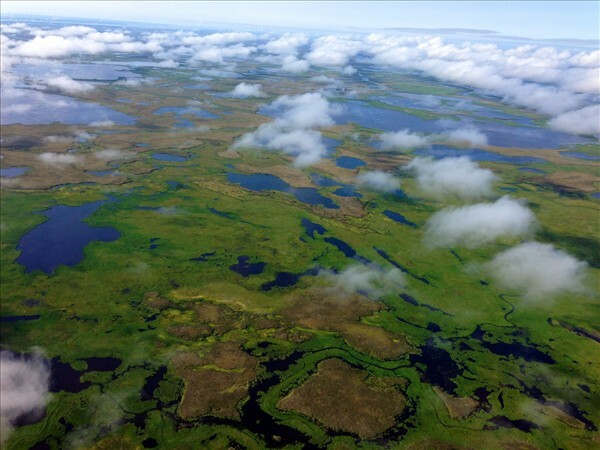 From the air, it’s a patchwork of water and land. In the winter time they become frozen into one making cross country travel by snow machine relatively easy. But the rest of the year, traveling by tundra is not. And that’s where the tundra tram comes into play. It’s a 420 foot tram built to help residents in their travels. 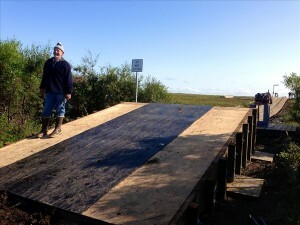 It looks like a heavy duty boardwalk with small railroad tracks on top. 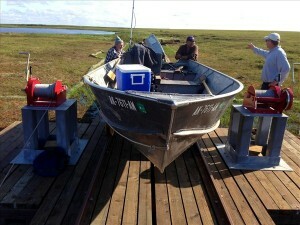 A large metal cart rolls back and forth that people can put their boats on, using a long cable and winch. Carpenter has spent the last month living at the site. In the past, his company, Carpenter Constructors, had built many walkways, decks and overlooks with treated wood, but never something like this on boggy tundra. Today, the project is getting the okay from federal oversight people and then Carpentar can go home. He loved the construction but it wasn’t without its challenges. The first tram was built here in the 1960s and was rebuilt several times since. This one is new from the ground up. First, the old water-logged material had to be removed by boat—about three loads per day. Then a hundred-thousand pounds of new treated wood was dropped off by helicopter. 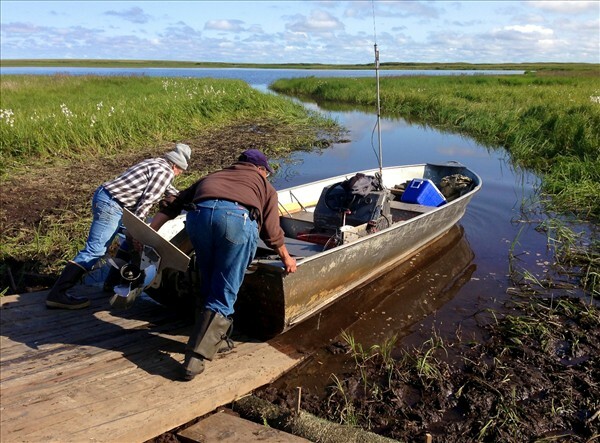 To get here, boaters maneuver through miles of lakes and sloughs, wade through some water, pull their boat up the ramp by winch and then onto the cart. Several yards away parallel to the tram, the tundra tells a story from the past. A wide groove like a grown over ditch, remains, from hundreds of years of residents pulling their boats back and forth across the land. Mike Beaver remembers doing that when he was young. He’s from the nearby tundra village of Kasigluk. He was hired to help build the tram and act as a guide to get to and from the site by boat. It’s about an hour’s journey from the nearest village and a four to five hour trip to the coast… but it all depends on how high the water is. Beaver says there are many reasons the tundra residents need to go back and forth: some to get to traditional camps, some go to fish, berry pick, hunt for birds or moose, or visit family. 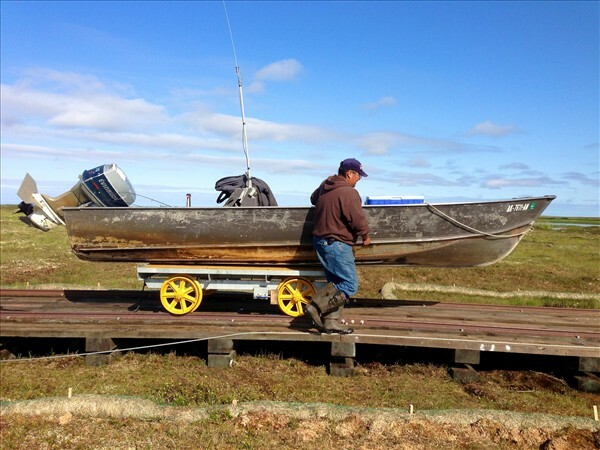 “And also for the coastal villages like Toksook, Newtok, and all the other coastal villages to have a safe way to cross to go into Bethel by boat during the summer instead of having to go all the way around through the ocean,” Beaver says. Just in the last week, Beaver says there’s been a dozen boats that have used the tram. His 70-something-year old aunt was one of them. 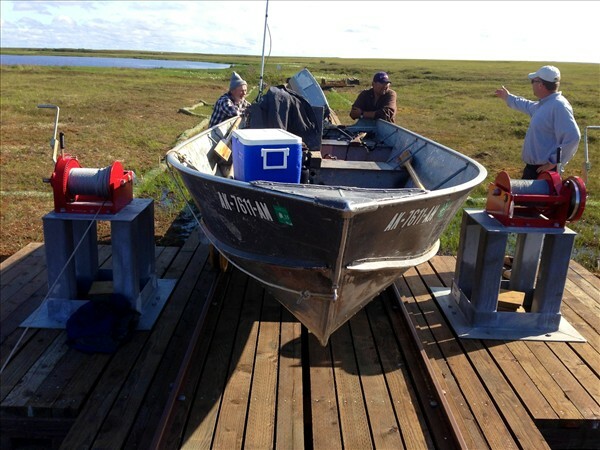 The tram project cost over a half million dollars and was funded by the Denali Commission.